Join FLAWLESS this summer and be prepared to be challenged!!! Students of ALL age groups and levels from beginners, intermediates and advanced are welcome so that you can learn at your own pace. With our Intensive course, you will be tested and pushed to the limit even if you are a seasoned professional! You will not only be taught in various different Foundation styles such as HIP HOP, HOUSE, POPPIN, LOCKIN & KRUMP from some of the industry leading Teachers and Choreographers. You will be given the tools to excel as a dancer and up levels as a performer. And if you’re a dancer who competes in regional competitions, we will also provide you inside tips on what could help you place or even WIN at competitions. There will be Prize Give-Aways, Scholarships, Meet and Greets, Q&A Sessions with our industry pros, and a little insight of what it takes to be successful in this industry. So if you Love to Dance, do NOT miss out the opportunity to be taught, by world class dancers and choreographers. So book your places NOW to avoid any disappointment! TIMES: 11am until 4pm daily. Please arrive 15 minutes before the start time to sign in. All students must be collected no later than 4.15pm from Rawlight Studios. Join us for the 2 days experience for £90 or you are welcome to come as a daily student at £54 per day. Places will be confirmed once payment has been made via the secure online booking links below. Booking and full payment must be made in advance. If you are booking for multiple days please repeat the booking process for each of the days you wish to attend. All prices are inclusive of VAT. You will receive an automated PayPal receipt once payment has been made and a further confirmation email from the Flawless Dance School once the booking form has been submitted. You will be directed to the booking form directly from PayPal once your payment has been made. 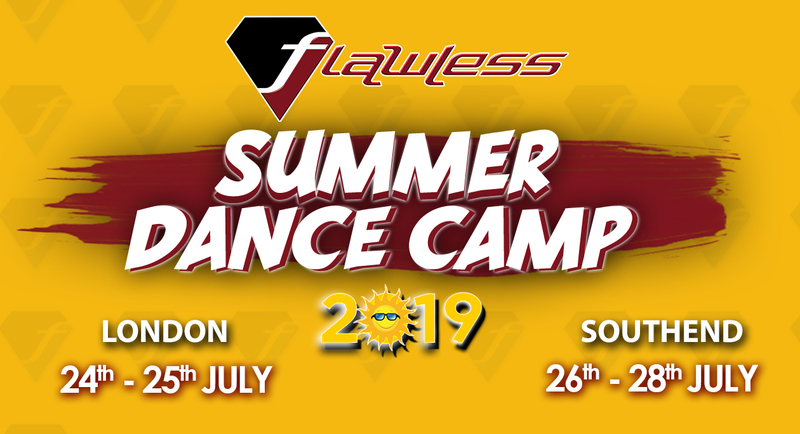 Please note Summer Dance Camp fees are non-refundable. There will be an hour break for lunch each day. Students are to bring a packed lunch and drinks with them. Only students with parental permission granted via the booking form may leave the building at lunch time with a chaperone. Students should wear comfortable clothes that allow freedom of movement and trainers. Please bring knee pads with you. Flawless Merchandise will be available for purchase during the week; however this is not a compulsory uniform. Our School Coordinator will be at the Dance Camp at all times. Please ensure she is aware of any medication that your child may need. Please do not bring valuables to the Dance Camp as we can not take responsibility for loss or damage to personal property.